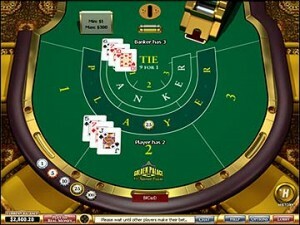 When people describe the game of online baccarat they will often reference James Bond. This is because baccarat was the game favored by the iconic English spy. Bond represents the ultimate in style and prestige. Baccarat’s association with the notorious spy has both helped and hurt the game. It has definitely increased the profile of the game and contributed greatly to its popularity. However, it has also made the game seem far more intimidating to play than it actually is. But that is just one of the many common misconceptions when it comes to the game of online baccarat. Below are some other myths that have persisted throughout the years. If you’ve spent any time researching betting strategy you will no doubt be familiar with the Martingale system. This controversial strategy can be applied to many different games including blackjack and baccarat. It is based on the idea of doubling one’s bet after each loss so that a win would not only cover all previous loses, but would also generate a profit equal to the original wager. Because the Martingale system only works at tables that have no maximum betting limits, you’d have to do some looking around to even locate such a table. You also need a substantial bankroll that lets you cover the exponential cost of doubling your wagers. Most players don’t realize until it’s too late just how fast a $10 bet can turn into $1,000. Card counting is highly effective way for blackjack players to beat the casino. Contrary to popular belief, the practice is not illegal. However, most casino prohibit card counting one, which does suggest that it does indeed work. And yet, because baccarat and blackjack have some things in common people will often mistakenly believe that the principles of card counting can be applied to both games. This is definitely not the case. Unlike in blackjack, the cards used in a game of baccarat don’t get returned to the shoe. So not only is card counting virtually impossible to do in a land-based game of baccarat, it’s entirely impossible to do with online baccarat. All casino games have a house advantage. This means that over an extended period of time, everyone loses. That being said, baccarat holds just a 1.24% advantage over the player. This makes online baccarat a far more profitable game than other casino games such as roulette and can be a much better investment than slots. As was stated at the very beginning of this article, online baccarat has a reputation of being a glamorous, exclusive card game. The simple truth is that you need little-to-no-skill to play online baccarat. You don’t even need to know what the cards mean before you start playing; it’s that easy. So don’t be intimidated by the game. It’s one of the most accommodating games you’ll find at the casino!